American inventor and industrialist; chiefly responsible for the adoption of alternating current for electric power transmission in the United States. Autograph Letter Signed, Geo. Westinghouse Jr, four pages, octavo, Pittsburgh, Pennsylvania, June 11, [1880s]. On his monogrammed stationery, to his mother, Mrs. Emeline Westinghouse in Schenectady, New York. With the original envelope. 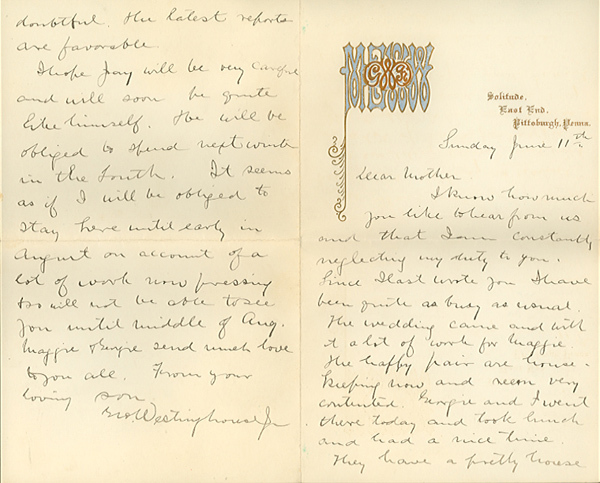 “I know how much you like to hear from us and that I am constantly neglecting my duty to you. Since I last wrote you I have been quite as busy as usual. The wedding came and with it a lot of work for Maggie. The happy pair are housekeeping now and seem very contented. Georgie and I went there today and took lunch and had a nice time. They have a pretty house nearly furnished and it is nicely located. You will be glad to know Maggie had been better the past two or three weeks than for a long time past. Georgie is well and just as nice as any boy can be. We have Mrs Bates & her two daughters and Mrs Hewitt and her daughter visiting us. They make very agreeable company and seem to enjoy themselves very much. The weather has been hot lately but today is fine. “My gas business grows all of the time but there has been less work to do than formerly was the case. John, the Butler, has gone to his home for a visit & will be gone six weeks or so. We miss him very much and hope he will hurry back. Frank has gone to Burlington Iowa to attend brake trails and I think will be gone three weeks. He seems to have gained greatly in health and strength during the past year. Mr. Snyder has lately been very ill and has been obliged to go to white Sulphur Springs in Virginia. He was so ill that his recovery was at one time considered very doubtful the latest reports are favorable. George Westinghouse most likely wrote this letter in the 1880s when he was developing his business in natural gas production and control. “In 1883, when the attention of Westinghouse was attracted to natural gas, this fuel was already being brought into Pittsburgh in a crude manner which led to many dangerous accidents. Applying his special knowledge of compressed-air problems, Westinghouse in two years had applied for some thirty-eight patents on apparatus for the transmission of natural gas. He developed a pressure system of transmission by which the gas was first conducted through eight-inch lines, then the diameter was stepped up to ten inches as the pressure fell, and so on through twelve, twenty, twenty-four, and thirty inches, with successively lower pressure stages. This natural-gas experiment, in which Westinghouse continued during its period of technical development, prepared his active mind for the rapid comprehension of the principles of ‘high voltage,’ ‘step-up’ and ‘step-down’ transformers and ‘low-tension distribution’ of electricity which inventors like Gaulard, Gibbs, and Tesla were later to expound to him” [Dictionary of American Biography]. Westinghouse, who married Marguerite Erskine Walker in 1867, had only one child, a son, George Westinghouse, III.